Rustic stone retaining walls and fieldstone slabbed steps lead up to a rustic stone pool deck that over looks the Hudson River Valley. A fog misting system has been installed in the patio. The fog system cools the stone on those hot summer days and provides a great effect especially at night with the landscape lighting bouncing off the mist. The gardens have been planted with an assortment of perennials, roses and flowering shrubbery. 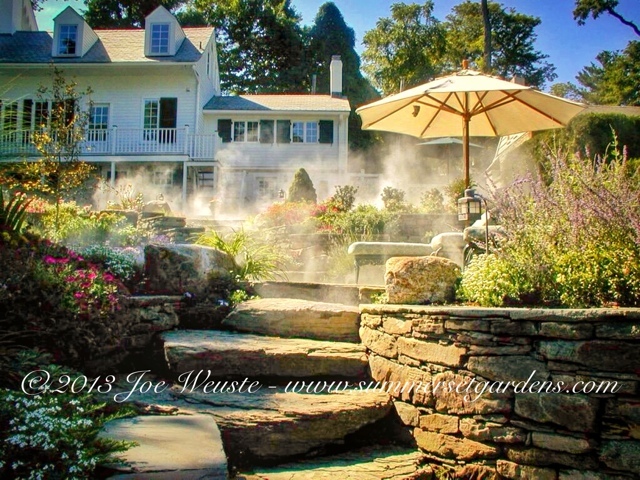 Landscape architecture, garden design and construction services in the NJ and NY areas.